When our previous dog mysteriously went missing, I decided that we had to get some security cameras for the house. I wanted something that wouldn’t require complex wiring, and given my role at TidBITS as “the HomeKit guy,” I ideally wanted something that would integrate with Apple’s Home app. I first looked at the options Julio Ojeda-Zapata identified in his “A Prairie HomeKit Companion: HomeKit Security Provides Peace of Mind” (11 September 2017), but I found those options unsatisfactory. The main problem was that Wi-Fi-enabled cameras are expensive. You’re looking at about $150 per camera, and not many support HomeKit yet. I didn’t know what to do until I saw a recommendation for the WyzeCam, a boxy little 1080p Wi-Fi video camera with limited free cloud storage, night vision, and a speaker and microphone for two-way communication — check out its video (which was not captured on a WyzeCam, alas). Those are all standard features for connected security cameras, but what seemed too good to be true was its price: $19.99. Add in $5.99 for shipping, so it’s really a bit closer to $30, but that’s still a fraction of the price of the competition. Unfortunately, the WyzeCam doesn’t support HomeKit, but for the cost savings, I’m willing to put up with that. I wouldn’t want a bunch of home automation devices that ignore HomeKit because having to interact with each individually would be a nightmare, but it’s acceptable for one or two. That said, now that Apple lets manufacturers enable HomeKit via a simple software update, I hope Wyze Labs adds support. Other than a lack of HomeKit support, what’s the catch? A $20 video camera must be a piece of junk, right? No, the WyzeCam’s hardware is solidly built and attractive. There’s no creaking nor rough edges — fit and finish are fantastic. And mine (for $20, I bought a couple) have suffered a number of drops from several feet onto hard surfaces with no ill effects. The WyzeCam is a little cube with a pull-out base stand that can rotate on three axes, so it’s highly flexible in how you position it. The base is magnetic, so it will attach to any surface with sufficient iron content. It also includes an adhesive metal plate you can stick anywhere you please. The included AC power adapter connects to the camera via a Micro-USB port, and the cable itself is detachable, so if you need a shorter or longer power cable, you can swap it for something that works better. There must still be a catch. The software — in the form of apps for iOS and Android — has to be lousy, right? Nope. The iOS app could be better, but it’s far from bad. The software often wants you to log in to your WyzeCam account when you first open the app, which is a little annoying. But since it supports Touch ID and Face ID authentication, the login process is quick and painless. The first screen shows you a list of your cameras, with a photographic preview of each. Tap a picture to see a live feed of that camera. Unfortunately, the app updates the previews only when you view the camera feed, making them less helpful than they would be if they updated as soon as you opened the app. As it is, they’re useful only for helping you remember where each camera is placed. In the iPhone screenshots below, you can see the preview on the left and the live feed on the right. As you can see, my dog has again dragged his bed into the yard because he enjoys soaking in the rain. If you’re wondering why the lens looks like it has something on it, that’s because it’s being reflected by a window directly in front of it. I explain why below. For $20, the camera feed must be blurry or blocky, right? No. The WyzeCam captures video in 1080p high definition with a 110-degree field of view. That said — and this does appear to be the catch — the WyzeCam captures only 10 frames per second, so its video isn’t terribly smooth. But the WyzeCam makes up for that by also recording video in the dark at up to 29.6 feet (9 meters), thanks to four built-in infrared LEDs. While viewing a live video stream on your iPhone, you can manually record videos and take still photos, which are stored on your iPhone’s camera roll. You don’t have to be home to view your camera feeds or record images, either. I often check my cameras when I’m out and about. You can enable motion detection and the WyzeCam will automatically capture 12 seconds of video when it senses motion in its field of view. It then stores that video in the cloud for up to 14 days for no charge and can notify you afterward. You can download these videos to Photos in your iPhone if you want to save them. The bad news is that the WyzeCam will record such video only once every 5 minutes at the most. I’d happily pay a reasonable fee for more frequent recording of detected motion — that seems like an obvious business opportunity for Wyze Labs. The WyzeCam can record continuously if you insert a microSD card. Unfortunately, it supports cards only up to 32 GB, which can either record about two days of HD video or a week of SD video. And, of course, you’ll have to extract the video from the microSD card in order to view it. The WyzeCam’s built-in microphone and speaker allow for some interesting features. It can alert you when it hears sounds, but more interestingly, it can listen for smoke and carbon monoxide alarms and notify you when it hears one go off in your house. You can schedule these alarms so you receive them only at certain times of day, like when you’re at work. While viewing a live stream, there’s also a voice button that you can hold down and speak into, which is then broadcast from the WyzeCam. I suppose you could use that to talk to a loved one or scare a burglar. In any case, it’s a neat feature. We take our customers’ data safety very seriously. The communication between your mobile device, the WyzeCam, and the AWS Cloud Server are made via https (Transport Layer Security (TLS)). We used symmetric and asymmetric encryption, hashing and other ways to make sure users’ information cannot be stolen. Each camera has its own secret key and certificate so that we can validate its identity during handshake. The contents are encrypted via AES 128-bit encryption to protect the data. Even if a hacker intercepts the data package, the data cannot be decrypted. 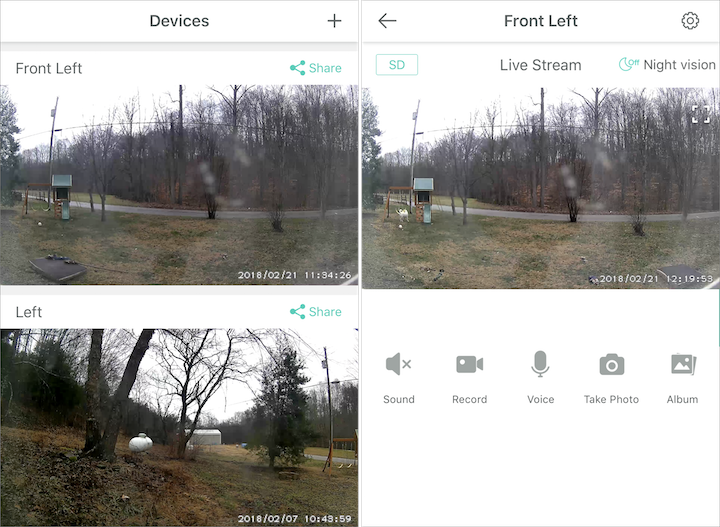 More importantly, the Wirecutter had Bill McKinley, executive director of Information Security at the New York Times test the WyzeCam along with other Wi-Fi security cameras, and it received his approval. The biggest drawback of the WyzeCam is that you won’t want to install it outdoors because it can’t handle freezing temperatures or getting wet. You could put it into a PVC enclosure, but night vision would be blocked, and you’d still have to figure out how to run power to it. I work around that by placing it on the top rail of my windows, pointed outside. Unfortunately, that renders its night vision useless, since the infrared light is reflected by the glass. So I turned night vision off and rely instead on standard motion-activated exterior lights. In fact, my WyzeCams mostly serve to monitor my exterior trail cams, which last for months on a battery and take still pictures whenever motion is detected — day or night. The trail cams are strapped to trees and the WyzeCams are pointed at the trees with the trail cams, so if someone messes with my trail cams, they’ll be filmed by a WyzeCam, and even if they subsequently broke in and grabbed the WyzeCam, it would be too late because the video would be uploaded to the cloud. I have the WyzeCams’ motion sensors on, but I turned off notifications so they can capture video without hassling me. If anything goes awry, I can check the footage. If you’re interested in a WyzeCam, I have good news. You can now pre-order the second-generation model, which provides motion tagging (which puts a green box around moving objects), a better camera sensor, improved audio, and a less shiny matte finish. The bad news is that you may be waiting a while to get one — it’s backordered by several weeks. Alas, we never found out what happened to our dog, but we got a new one, a Great Pyrenees who you can watch playing with his bed in the video above — he also made a cameo in “Rescue Blurry Photos with Live Photos in iOS 11” (7 February 2018). I’m curious about the security of cameras like this. How do I know the network is secure? Can someone look into my house? This is the advantage of using such devices pointed only outside your house - someone might well be able to gain access to the device (you should assume so!) but they only get a view outside of the house. This is different from all the Internet connected cameras and microphones inside your house (eg HomePod, Google Home, Sonos, etc, not to mention your TV and of course any laptop or iMacs you have!). So it is relatively safe to use this sort of thing as a security camera if you are simple pointing *outside* your house. Of course, if you stick one of these in your living room (or heaven forbid, your bedroom), all bets are off…). At that price I'd be very cautious. If they're not making money on the hardware, maybe they're making it off of collected data. What data does this camera collect and send elsewhere? How do you go about diagnosing such hardware in this respect? We've had two since Christmas. Agree with the review. My biggest complaint is the software. The adjustable stand is nice, but not stiff enough (can get misaimed easily). For weatherproofing I'm trying a Talenti ice cream container. Image quality seems OK in container, but suffers when sun shining on the container, but still good. In other words any hard plastic clear container should work, although I've no idea about the IR. The time-lapse function maybe can extend the shooting time depending on your needs. Rough data: 7.4GB for 24 hours of HD at 3 second intervals. Either my numbers are wrong or there is a lot of compression in the video (which is likely since the scene doesn't change much). So maybe not much advantage for security. Am I correct that this can only be set up and monitored directly when on the same WiFi network? PS If you need help emptying the Talenti container, write! You can monitor it while away from home. I'm not sure they even sell Talenti around here, but thanks for the offer! Can the firmware be updated automatically? This is the current core question to ask of any IoT device. If the firmware cannot be updated, then consider the device to be dangerous junk just like most IoT devices. When a security exploit was found in the Ring Doorbell (camera, microphone, speaker, WiFi...), there was some commotion in the tech community. Except there was no reason for upset specifically because Ring immediately pushed out a firmware update to ALL their devices that solved the security hole. That's how IoT just work. So far, I'm not hearing of any method for updating the WyzeCam firmware. Let's find out if there is one. 1) Yes, they very actively update the firmware. The company essentially creates software for third party hardware marketing under their name. 2) The firmware updates rely upon user vigilance. They are not automatic. That's a source of danger. It is rare for users to understand or bother with firmware updates, including in the Enterprise market where they are paid to know better. 3) The hardware is licensed and obtained from China. This fact should bring great pause when considering buying WyzeCam gear. Chinese surveillance gear is now infamous for being hackable and hacked. Yes, the firmware gets updated pretty often. I tried two of these cameras. Despite assistance from the company, they would not connect to my Google WIFI. The company admitted that is a problem that they hoped to rectify in the future. I returned the cameras; they assured me they would process the refund quickly. That was January 23; It is now March 6 and I still have not heard from them. Update: I emailed the company this morning and they sent out my refund. I hope in the future the cameras will work with Google WIFI.